Samsung have confirmed local Australian pricing and availability for their new N950 and N850 soundbars. “The N950 and N850 are defining products for Samsung and a testament to our deep commitment to deliver products that break new ground for our offering and give Australians an incredible experience,” Mahdi added. Replacing the previous Samsung K950, the N950 features 17 speakers while the N850 features 13 speaker. Each features a bevy of dedicated amplifiers, upward and side-firing speakers plus a set of wireless rear speakers and a similarly-wireless subwoofer. In addition, both support Dolby ATMOS and DTS:X, as well as 4K pass- through and 32 bit sound up-scaling. The Samsung N950 and N850 also support Samsung's One Remote in addition to the bundled controller. Users can also control the Samsung N950 and N850 via Samsung’s SmartThings app on their compatible smartphone and Amazon Alexa. However, there's no standalone Alexa or Bixby nor is there any sort of Google Assistant or Chromecast integration. The Samsung N950 soundbar, including subwoofer and rear speakers, is priced at an RRP of $1999. 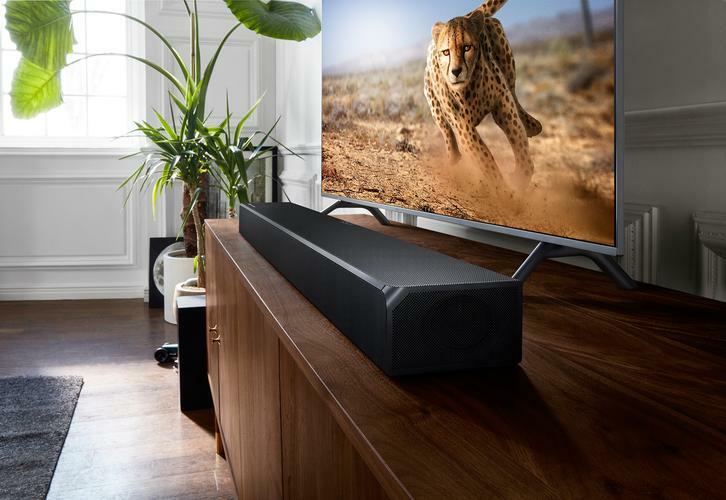 The Samsung N850 soundbar, including subwoofer, is priced at an RRP of $1499. The Samsung N950 and N850 will be available at select retailers from mid-August.